A surgeon at Baylor University Medical Center in Texas has a new way of doing hip replacement surgery that works better for heavier patients. If you are contemplating hip replacement surgery, especially if you pack a few extra pounds, ask these questions. In 1965, I became the subject of an article in the medical journals. During successful surgery to remove a cancerous tumor in my hip, the doctor fashioned a new hip joint for me out of my own bone. I have always thought of Dr. Robert Murray, who died of bone cancer himself in his 70's over 40 years ago, as a kind of miracle worker. I never once felt the slightest pain from my hip. I've had many health challenges, but I have been able to do things like water skiing, rock climbing, snow skiing, hiking, and gardening for most of the 48 years since my operation. 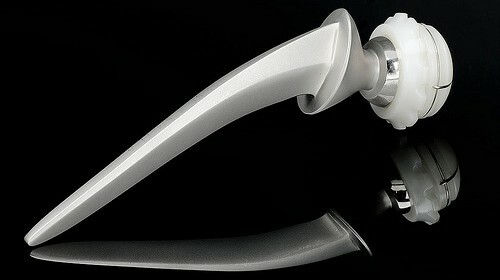 Thanks to a wonderful surgeon who had an innovative idea for hip replacement, my hip has worked perfectly. One of the things my surgeon did differently for my hip replacement was to perform the surgery from the front of the hip joint rather than from the back of the hip joint. And recently another surgeon has been getting great results with the same technique. Dr. Steven Sanders, an orthopedic surgeon at the Baylor Health Care System, performs 3 or 4 hip replacements nearly every day. In the 16 years he has been practicing surgery, he has found that he gets better results if he cuts from the front of the hip rather than, as most orthopedic surgeons perform hip replacement procedures, from the side of the back. Cutting from the front, Sanders says, avoids cutting through muscles or tendons. Cutting from the front of the hip reduces pain. It reduces swelling. (In my own procedure I had no pain and no swelling.) There is less likelihood of needing a transfusion during surgery. There is lower risk of dislocating the hip after surgery. Even better, when the surgeon operates through the front of the hip, the patient does not have to relearn how to sit, relearn how to walk, or pay attention to turning or not turning, to ensure that the hip heals after the procedure. Most hip replacement patients have to get around with a walker for at least 2 months and often 3 or 4 months after their surgeries. Patients of Dr. Sanders, however, typically only have to use a walker for only a week to 10 days. Getting back to normal after the front-entry hip replacement surgery takes longer, but Dr. Sanders reports that most of his patients are fully functional after about six weeks. Alternative Health News, A New Route to a New Hip--In-Depth Doctor's Interview, ivanhoe.com, Accessed 25 August 2013. Berger RA, Sanders SA, Thill ES, Sporer SM, Della Valle C. Newer anesthesia and rehabilitation protocols enable outpatient hip replacement in selected patients. Clin Orthop Relat Res. 2009 Jun.467(6):1424-30. doi: 10.1007/s11999-009-0741-x. Epub 2009 Feb 28. How do you find a spinal cord specialist to treat you if you have no insurance???? Orthopedic Surgeon or Podiatrist for bunion surgery? Anyone know a good bunion surgeon in the Knoxville, TN area? Can surgery fix shoulder injury?